Visit the membership page for all the details!! You're invited to a community-wide birthday party to celebrate the library's centennial and kick off the annual Summer Reading Program. Details are still being worked out, but the party will be Saturday, June 15, during the day, probably in Jackson's Detert Park. Fun for the whole family - from kids' activities, some of your favorite library performers, lunch food, birthday cake, and much more. Best of all, it's FREE. 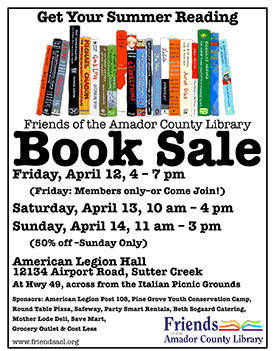 It's our way of honoring your continuous and growing support of the Amador County Library system across the century. Watch this space, social media, the Ledger Dispatch, and of course all five library locations for more information. Looking for information on people, places, or events in Amador County's past? The Save Our History project has made it possible to search online for stories and ads in Amador County newspapers dating back to 1855. Phase 1 of the project includes newspapers through 2004, and we are currently working on bringing the website up to date. Generously funded by the Ledger Dispatch and by many local donors including Stan Lukowicz, the Native Sons of the Golden West, Rotary, and numerous individuals and families, the project is co-sponsored by the Ledger Dispatch and the Friends of the Amador County Library. The archives are available free of charge to everyone. No library card is needed. Access is via the library home page (https://www.amadorgov.org/departments/library). More details about the project and this milestone are on the SAVE OUR HISTORY page. 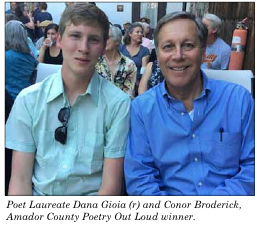 Dana Gioia, the California State Poet Laureate, is on a mission to visit all 58 California counties during his two-year term. Amador's turn was June 15. 2017. Gioia was appointed by the Governor in December 2015 for a two-year term as California's Poet Laureate. The Poet Laureate serves as the state advocate for poetry and literature in libraries, classrooms, and boardrooms across California. Born in Hawthorne, California, Dana Gioia was the first person in his family to attend college. As National Endowment of the Arts chair (2003-2009) he launched several nationwide programs, including Poetry Out Loud, a national competition for high school students to learn poetry, perform it, and win prizes. He is also a prolific essayist, reviewer, critic, and translator.